J.M. Smucker has drastically underperformed the market due to growth concerns and a balance sheet loaded with debt. Despite a need to deleverage, the dividend is likely safe. However, we expect the dividend's growth rate to fall to 3-4% over these next few years while debt is paid. The stock has appreciated well since January, limiting short-term price upside. We still like the stock's value for investors with a 5+ year holding period. Shares of spreads, coffee, and pet food giant J.M. Smucker Company (SJM) have disappointed since reaching highs of just under $160 per share over the summer of 2016. Since then, the stock has been outperformed by the S&P 500 by a margin of negative 16% to positive 45%. 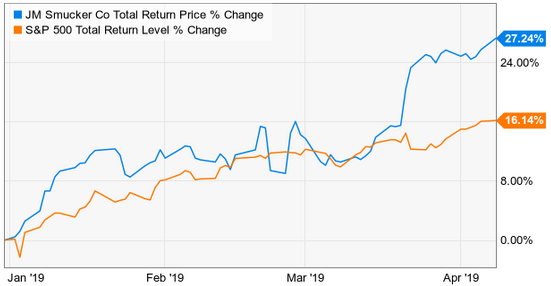 Questions about growth and the large debt load created by blockbuster acquisitions of Ainsworth Pet Nutrition ($1.7 billion) and Big Heart Pet Brands ($5.8 billion) have created a cloud of negative sentiment around the stock. As a dividend growth stock of 21 years, Smucker is well known in the dividend investment community. The company's current dividend yield of 2.92% is well above its 10-year median (approximately 20%). Given the company's need to deleverage and a multi-year run of market underperformance, we reviewed the company's payout to determine whether the dividend is in danger of a cut. While our findings concluded that the dividend is likely safe, investors may need to adjust their expectations of growth for the upcoming years. Several years ago, J.M. Smucker felt that a drastic "remodel" of its business was needed in order to grow over the long term. The company identified pet food as a synergistic and growing market that it could penetrate and dove in with both feet. After spending more than $7 billion across two blockbuster acquisitions, the company has completely transformed its revenue profile from five years ago. These drastic measures did come at a sizeable financial cost. The balance sheet as it currently stands carries more than $6 billion of debt. With a cash balance of just over $200 million, that is a debt to cash ratio of just 30:1. 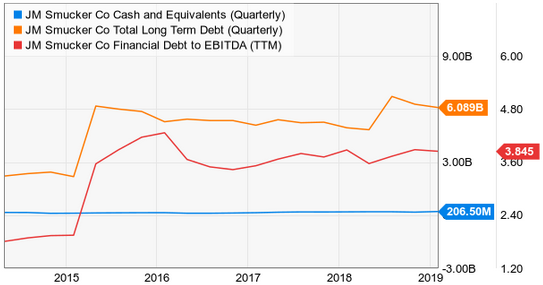 Furthermore, the company's leverage ratio of 3.84X EBITDA is well above our 2.5X cautionary threshold that a company is taking on too much debt. This is obviously not a good long-term position for the company to operate in, and management is well aware of that. The problem is that this situation cannot be corrected overnight. Management is estimating that we are still two years out from reaching a leverage ratio of 3.0X EBITDA, which is still above our threshold (and Smucker's past leverage norm) even then. With a prolonged financial mess to work through, attention shifting to where cash is being spent is a natural reaction. J.M. Smucker spends a decent amount on its dividend. 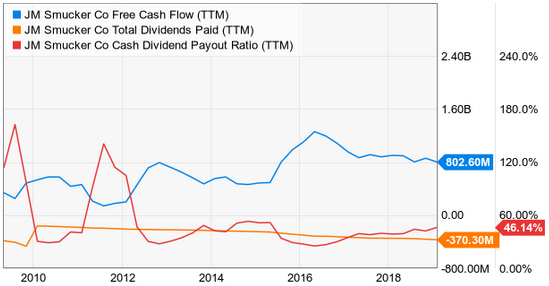 Over the past ten years, Smucker has allocated approximately 35%-45% of its free cash flow to investors in the form of a dividend. The dividend payout has grown well, with a ten-year CAGR of 10%. Despite the state of the balance sheet, management issued another 9% bump this past summer. With what is more likely a vote of confidence than an indicator of future results, investors should probably expect dividend growth to be scaled back for a few years. The cash payout is already at the high end of its historical range, and the deleveraging process is killing EPS growth both in the cost of servicing the debt (costing Smucker 1% on EPS growth), and lack of stock buybacks. When Smucker raises its dividend this summer, we are expecting a modest bump to the quarterly dividend of between $0.87-$0.88 per share. Are Shares A Buy Today? Despite extended underperformance to the market, shares of J.M. Smucker have been on a nice run since the end of the year. 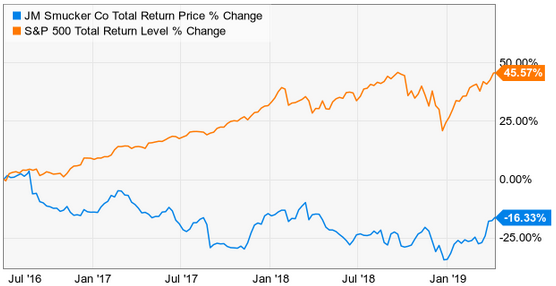 Since January, Smucker has taken a turn outperforming the market with a YTD total return of 27%. Investors considering J.M. Smucker should keep a couple of things in mind. Despite getting hot over the past few months, the stock is still drastically undervalued when looking at its historical norms. With a PE ratio of 14.75X this year's guided earnings, Smucker remains 21% undervalued relative to its ten-year median PE ratio. However, investors need to also note that the fundamental issues that have kept the stock down have not yet dissipated. The balance sheet is a long-term process, and the company's most recent quarter produced net sales growth of just 1% when you strip out the addition of Ainsworth. J.M. Smucker hasn't yet taken its performance to the next level (consistent 2-3% comparable sales growth). The days of getting shares for under $100 are likely over, but we feel that Smucker's return to its prior-year highs will be a journey. Because of this, the short-term upside is likely limited. We feel that shares would be more appropriately priced in the $105-$110 range for those with short-term intentions, as Smucker's appreciation should track its steady operational improvement. We maintain our long-term bullish thesis on Smucker, with accumulation under $120 per share likely to provide strong total returns over a five-year and longer holding period. Disclosure: I am/we are long SJM. I wrote this article myself, and it expresses my own opinions. I am not receiving compensation for it (other than from Seeking Alpha). I have no business relationship with any company whose stock is mentioned in this article.